HEN DARIUS CAME to the throne, upon the death of Belshazzar, he set over the kingdom a hundred and twenty princes. Over these he appointed three presidents, of whom Daniel was first. Now the princes and other presidents were jealous of Daniel, and sought to find some fault against him; but could not, as he was a faithful servant of the King. Then they tried to injure him because of his praying to God. 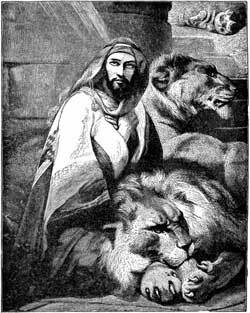 So they came to the King, and said, "King Darius live for ever: all the great officers of thy kingdom have consulted together to establish a royal law, that whosoever shall ask a petition of any god or man for thirty days, save of thee, O King, he shall be cast into a den of lions." The King signed the writing and established the law. But Daniel still knelt and prayed three times a day as before. His enemies saw him praying, and told the King, urging him to carry out the law. But the King was angry with himself that he had agreed to such a law, and tried to think of some way to save Daniel. Then these men urged that the law could not be altered. So Daniel was cast into the den of lions, and a stone was put over the mouth of the den, which was sealed by the King and the lords. But the King had said to Daniel, "Thy God whom thou servest will deliver thee." The King passed the night fasting, and could not sleep. In the morning, very early, he arose and went to the den of lions, and cried with a lamentable voice, "O Daniel, servant of the living God, is thy God able to deliver thee from the lions?" Then Daniel said, "O King, live for ever. My God hath sent His angel and shut the lions' mouths."